Before releasing his long-awaited debut ‘First Opus’, Sinjin Hawke had already achieved recognition as one of the most groundbreaking producers in the experimental club realm. A specialist in choir manipulation and monolithic orchestral arrangements, collaborative pieces with Just Blaze, DJ Rashad and MikeQ paved his way to produce for Kanye West and Frank Ocean. With the establishment of Fractal Fantasy in 2014, Sinjin and Zora Jones created an environment for their interactive experiments to live in, and by 2017 it was being touted as one of the most innovative new audiovisual platforms. In the wake of 'First Opus', Sinjin has already started to work on new compositions, which audiences should expect to hear in upcoming performances around the world. Zora Jones enters the international arena with debut release ‘100 Ladies', a profoundly unique seven-song offering that elicits shattered glass nested in choral arrangements, seemingly beamed from deep space. 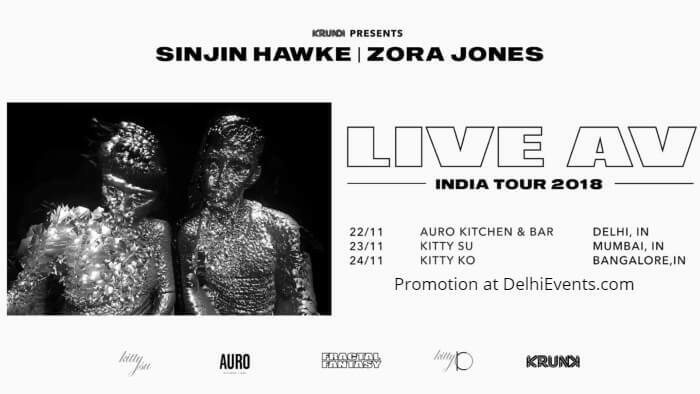 Zora's prowess in contemporary sound design has established her as one of the most intriguing technicians of 2015, and with the creation of Fractal Fantasy alongside orchestral master Sinjin Hawke, the pair's series of videos and interactive experiments have challenged archetypes of traditional artistry with an unparalleled attention to detail. Catch them in the darkest rave near you as they drift around the globe casting streams of liquid metal in their wake.